The past week has passed by incredibly fast! We have the first formative assessment of the course on the 9th of December, and as it draws near the time seems to pass faster! I seem to have an ever growing list of things that I want to accomplish in a week, yet my week seems to be shrinking!! I recognise that this feeling is often present when I am feeling particularly inspired and driven within my practise. Whilst there is an anxious sense of wanting to get everything done now- it is a good feeling. There is a sense of desire to be in my practise as much as possible; but this can be difficult to juggle when you have a family! Speaking of juggling, this week I have spent it juggling different works. Pushing ongoing works forward whilst also engaging with new concepts- mainly due to the fact that I have started to take part in some workshops developing new skills in plaster work, mould making and also, (I’m incredibly excited about this…) Bronze casting! I felt that this was an incredible opportunity that I really needed to embrace. It is a material I hadn’t considered working with previously, but I think that it could add an interesting dynamic to my practise. I often work with the body as material, which is often temporary and fragile- yet Bronze exists in opposition to these qualities. I thought it could be interesting to juxtapose these qualities together. Bronze also seems to be a very traditional material, heavily associated with history and monuments. Yet my usual work seems to have a spontaneity in it’s temporariness- so the permanence of bronze could show my concepts in a whole new way. I am excited to see how this exploration may allow my thoughts to branch out. I have been thinking a lot recently about the feminine and femininity, and Bronze casting in the foundry setting seems to be perceived as such a typically masculine thing to do. I like the idea of challenging this notion in my work. To explore femininity using typically masculine materials seems to have an irony to it! Whilst developing these new skills I have continued to work on the hairy underwear works previously mentioned. There is a strange quality to them that I really like, but the Tulle I have used to make the underwear is so see through that they are difficult to see!! (Seems obvious really!) I like that they seem to be there, whilst not fully being there. I like the ephemeral quality to them. The absence that the see through Tulle creates seems to be quite powerful visually. I feel that they create a space which the mind wants to fill; maybe with your own body- or a body in mind. But the fact is that they are very difficult to see. Admittedly the studio walls are white, and so you would expect them to disappear on them; but no matter where I place them, or on whatever colour- they are difficult for the eye to pick up. Also, the meshy pattern seems to make the hairs disappear too. During a plaster workshop we used scrim- and it struck me that it could work as replacement for the tulle. Originally, when I first began working on this piece I imagined that I would used a material that had a rigidity to it. The tulle didn’t have that rigidity that I’d hoped for, but the scrim does. It also has the opacity that I was looking for, and because it is an off-white colour it is visible against the white wall. It is actually a natural colour- sort of skin like. The more I work with it the more I love it! It is actually much easier to work with. The rigidity means that the aerator (wig making tool) moves thought it much more easily. I found working with the tulle became very irritating, and so I didn’t want to do it- even though I wanted the completed piece. With the scrim I am able to work faster- which means that the quality of the way the hairs are attached is better. Thinking back to the hairy knickers I need to think about how they would be displayed. I think by using different methods of display in a space will help me to understand how they could best be shown. Maybe it would also help me to better understand them. I have wondered if they could be worn but I would find that too exposing for myself to wear them. It is definitely worth considering. That way they would become performative objects. I am also thinking about suspending them so they exist in the space at the height you would wear them. That way they may actually bring the absence of the body into the piece more. But then again I like being able to meet the details of the hairs at eye level. I think the only way to resolve this would be to actually try it out. So, I finally did it! I bit the bullet and experienced my first performance! I have to say that I feel a huge relief to have finally done it. What an experience?! I feel like i have just discovered a new medium to explore. Obviously I have been aware of it, but to experience it is something else. It has opened up a door to a whole new area of possibilities! I decided to redo the work, ‘Hand Stitched’. The reason for the redoing was that I felt that by exploring a work that was familiar to me I would be able to just allow myself to experience what was happening, rather than thinking about the logistics of a task. I didn’t want there to be too much unpredictability for my first performance- although I am aware that there is a huge amount of unpredictability in how the audience will react to the work. I also felt that it would be beneficial to explore the performance side of Hand Stitched as I have already explored the work as a photography piece, a film piece and also an installation piece. 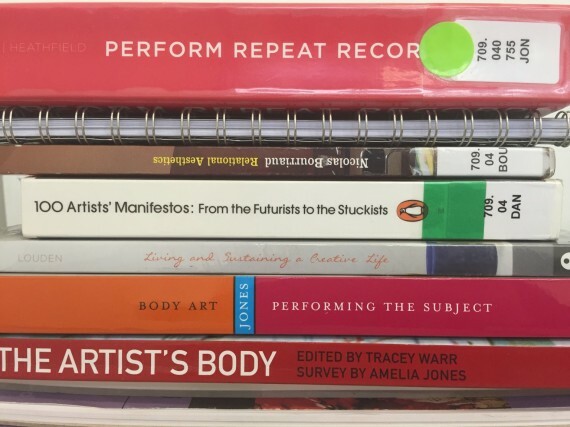 I hoped that by exploring the performative aspect of the work I would be able to gain further insight into how the work differs through it’s different presentations. How much can a work really change when presented in varying forms? Is the original action the work or the documentation? Or could they be separate works? I feel that this work has remained unresolved and it was my hope that I would feel more resolved by doing this public action. I decided to sit in the transitional space of the landing which connects the Fine art studios and offices. It is a space that is lined with access to the toilets, the lifts and also the kitchen, and so I felt that it would get lots of passers by, particularly during lunch time. My worry with sitting in a room was that I felt that people may not come to see the work, especially as everyone is preoccupied with their own work. By sitting in a transitional space I was taking the work to them. I became sort of unavoidable, but I later found that I was actually avoidable by passers by sometimes choosing to look in the opposite direction!!! I sat opposite the lift so I was, for many people, the first thing they encountered when they arrived on the 3rd Floor. This most definitely generated that jarring experience I had hoped for. 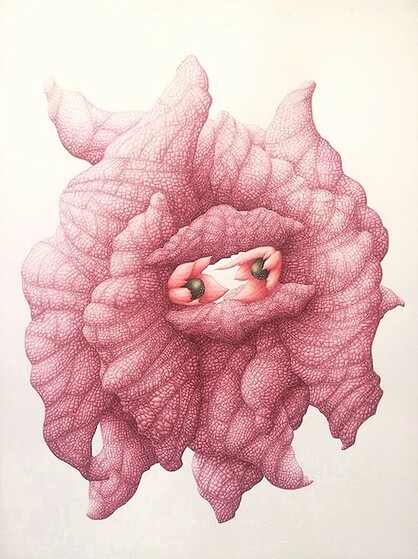 One thing I was unsure of was the amount of a connection or relationship there would be between myself and the viewer. Because of the focus on the stitching and the meditative aspect of the performance I found that I felt removed from my surroundings. Whilst I was aware of people being in and moving through the space I felt disconnected from them. They became part of the building, separate from me. I think this was partly down to the lack of eye to eye contact, but also the meditative aspect of my experience was hugely responsible. 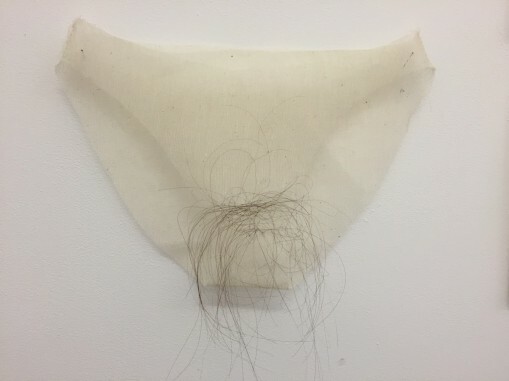 Whilst reflecting on the process after, I worried that as it was a performance that maybe I should have connected more outwardly with the audience; but that would have compromised the actual stitching and disturbed the meditative process. I later managed to have a chat with one of the tutors who had unexpectedly arrived at the performance from the lift and he raised an interesting point in relation to the eye contact dilemma; he said that he found it to be an incredibly odd experience to enter the space where I was and for me to not even acknowledge that him or anyone else was there. 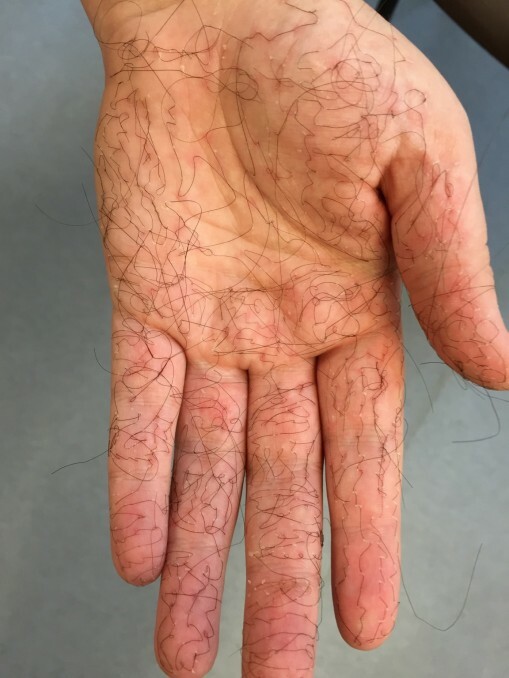 I sat for 2 1/2 hours stitching my hands without looking up or away or at anyone else. As my tutor said, it was odd behaviour, and so it became quite a surreal experience for both myself and the viewer. Actually, thinking about it, after a while of stitching- as time began to seem to pass differently and also as meditation set in I felt like I was in a dream. It really was incredibly surreal! As far as engagement from passers by, as far as I was aware, most people tended to just pass through the space, a lot of them several times throughout the 2 1/2 hours. A few people did stand and watch, but for most this didn’t happen. I wonder whether the presence of cameras on tripods filming the scene put people off? Even as I was setting up the cameras people seemed to want to avoid being in the space and on camera. I wonder if had the cameras not been there whether people may have stopped and watched more? But maybe that was also down to the nature of both the space and also the audience. The space, being one of transition, naturally tended to only hold an audience that was in transition; moving from a-b. I had hoped that being sat opposite a lift would have meant that that time taken waiting for the lift to arrive would have meant that people would have been faced with a situation where prolonged looking would have happened; but interestingly, looking at the footage, people seemed to look in the opposite direction! I suppose that when you take a surreal experience and place it in a non-art situation you potentially generate an awkward situation for people. 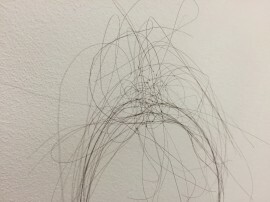 With regards to how I felt being surrounded by people when carrying out an act as vulnerable and exposing as stitching my hand with hair, (which I had been terrified of previously!!) I was really surprised. In my fearful pre thoughts, I had anticipated being mocked / judged and also feeling completely self conscious throughout the process. In contrast to this, despite a nervy start, once I settled into it I felt comfortable being watched. I think the detachment through meditation helped this; but I did also feel energised when I could feel a persons presence in the space. It was surprising to me that the presence of others would be an encouragement to me. It seemed to feed into the performance. I am curious as to how I can take this forward. I need to edit the film footage captured as documentation. Although what I have seen of it so far I am disappointed with. It seems to be very static and poor quality- but we’ll see when I actually take it into the editing suite. I think I also need to further explore the effect of the cameras being in the space. Maybe talking to some of the passers by to get feedback? Maybe redoing the work with no cameras? The documentation issue need resolving for sure. I find that when I have one eye on the performance and one eye on documentation I get conflicting thoughts. I think that the best option would be to have other people in charge of capturing the imagery so that I can focus purely on the performance. The trouble I have with this is that I don’t know anyone with photography and filming skills. Also, there is the struggle of letting your work go into the hands of others. I know it is something that I have to get over though because I can’t do everything myself. I cannot be performing and photographing! This past week has be one where I have allowed myself to immerse myself in more ‘doing’ in order to connect with my thoughts, opposed to previous weeks where thinking and research has been my priority hoping that it would lead to action. It has actually proved to be successful- I am feeling much more connected and in control (to a certain degree) of my practice. I realise that in previous weeks I had been taking so much information on board, and there had been so much critical analysis going on that I hadn’t allowed myself time to percolate my thoughts and digest the information. 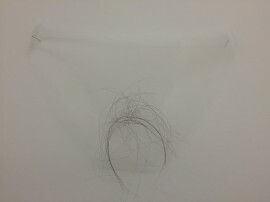 Working with the hair again and doing something with such a slow repetitive process such as attaching individual hairs to the tulle underwear have meant that I have reconnected to the meditative part of my practise that I had been missing. Ideas and understanding of my thoughts and position in relation to what I have been thinking conceptually seem to clarify when completing these type of tasks. With regards to the visual aspect of the underwear there is something about them that I really like. I am unsure of how much hair I should attach and so I have decided to make several, all with varying amounts of hair- similar to the variety of pubic hair styles that are out there!! The transparent quality of the tulle adds an interesting dynamic to the work- It seems to create a void where the body would be. A space to be filled, maybe with your own body in mind? 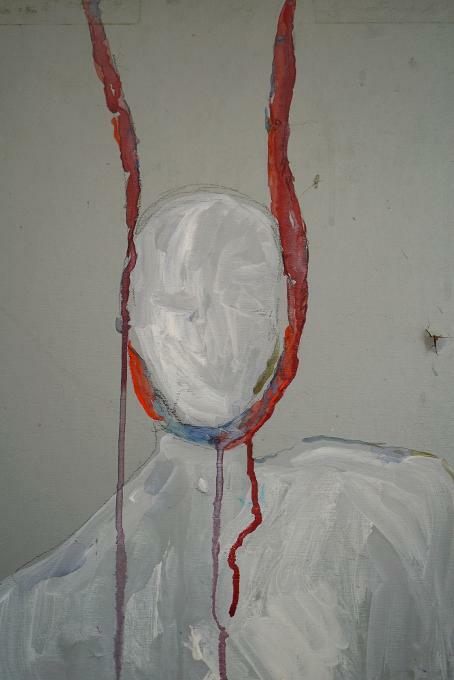 I realise absence of the body seems to be returning in my work. During our group tutorial I discussed these works, but also raised the point that I feel that until I finally experience the performative side of my work that I won’t feel that it is a resolved part of my practice. It will be a question that will dominate my thoughts. Judit raised the question of what do I hope to learn by doing the performance? I have thought about this, and I suppose I won’t entirely know this until I have done it. I think I hope to understand what it feels like to explore an action in real space and real time with the viewer immediately present. It might be that I decide that once I have done it that I have ‘got it out of my system’ and no longer feel the need to use performance in my current practice; or it might be that it leads to a ‘eureka’ moment where a new area of my practice is revealed to me. As a group everyone seemed to agree with me that I needed to go ahead and do a test. It was suggested that I might want to consider doing the action in a private space and then have a live stream projected to a public space within the college. 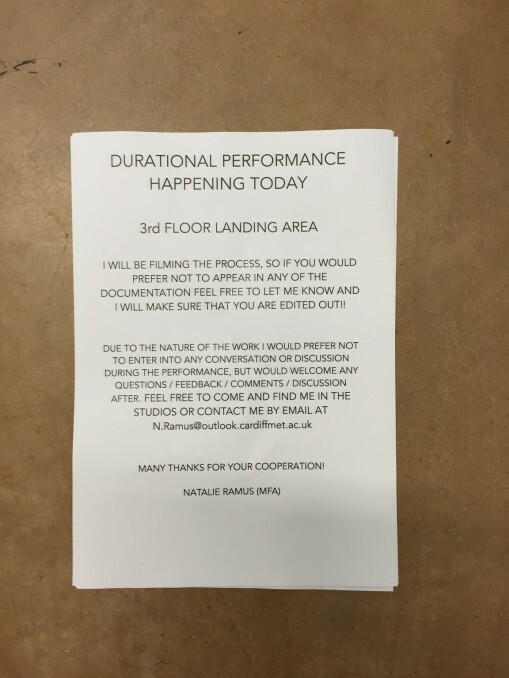 When I considered this I felt that that would just be avoiding the public performance further and that it wouldn’t actually resolve any of the questions or curiosities I have. I have avoided this for long enough, putting yet another screen between myself and the audience will not resolve anything. And so, I am at the point where I am planning a test performance. I have decided to redo the Hand Stitched work. It is a work that I am familiar with, I am aware of the logistics and the how-to’s; and so as a result of this I will be able to focus on the actual process of performance without having to worry about unpredictability of an action. I need to make this first experience as easy on myself as possible! I am thinking that if I do this action in a set room it is unlikely that many people will go out of their way to come to see me- art students tend to be busy making art! I am keen to explore the idea of doing this action in a transition space. Whether it is in the lifts, on the landing, in a corridor. Either way a space which will have lots of passers by. Where people will be passing quite close to me and so will be able to see the detail of my action. I also like the idea of people seeing me performing the action of stitching, and then a few hours later pass by and see me still there. The idea of experience of time being illuminated through my practice is one that seems to reoccur, and one that I would like to resonate with the viewer through my work- hence the durational aspect of a lot of the work I make. I hope to actually face this performance situation head on at some point during this coming week- hopefully Thursday. I realise that part of what makes me hesitant when I talk about performance with others is that there is an expectation that I will potentially be committing to performance art as my medium. But do we really need to commit to a single method of exploration? Can’t we be sculptors and performers? Is it not just a case of using a variety of methods to explore a single concept or line of enquiry? Looking at the work of Poppy Jackson and Helena Goldwater brought me comfort in relation to this commitment issue! Seeing that they have a practice that involves performance and painting seemed to allow me to give myself permission to not place myself in a box.